Here is a truth: There’s no such thing as having too many smoke alarms. 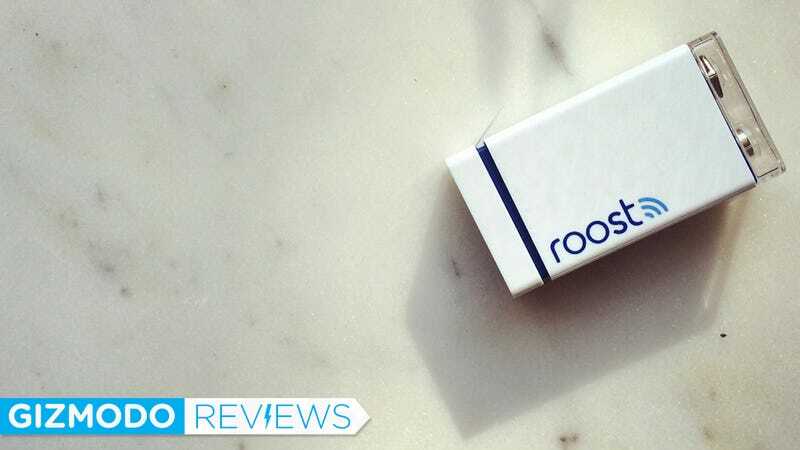 There’s also no such thing as having too many companies trying to make smoke alarms smarter–which is why Roost, a $35 battery that connects any old smoke alarm to the web, is so interesting. A 9-Volt battery that you can install in any smoke or CO alarm and, using a mobile app, monitor the alarm’s activity the same way a “smart” alarm does. It’ll send you notifications if the alarm sounds, and ping you when you’re running low on battery, too. At $35, it’s far cheaper than most of its purpose-built competitors. The idea behind Roost is so simple, it’s almost elegant: Take the concept behind full-fledged products like Birdi Smart Air Monitor ($120), First Alert’s Smart Smoke Detector ($50), or Nest Protect ($99), and miniaturize it into a cheap battery that can be installed on any 9-Volt alarm that’s already in your home. It’s almost like a product design troll: We took your industry-changing idea and put it into a form factor than millions more consumers can afford. Roost first crossed our radar last January when its creators showed us an early prototype of the device at CES. This week, it’s available to buy on Amazon for $35, or $65 for a two-pack. As a lazy person, I was excited to learn I’d spend only five minutes setting Roost up, according to the installation guide. After I pried my dusty kitchen smoke detector from the ceiling, I realized it would take a little longer: All the alarms in my house run on non-replaceable li-ion batteries, not 9-Volts. I fired up Amazon and ordered a $10 alarm that ran on 9-Volts. Installation is similar to other “smart home” devices: You swipe through a series of instructions, enter your wifi password, and then let the app pair with the hardware. But I mention it because the actual pairing process is unusual: You line your phone’s speakers up with the battery’s edge, and it blares 10-seconds of scratchy dial-up-esque noises at the tiny battery. I’ve reached out to Roost for more information on this process, which seems to use a certain frequency to activate the battery. After a few attempts, I was connected: A test run of the alarm sent a loud audio alarm and a pop-up notification to my phone: Warning! Your Kitchen alarm is sounding! I popped the battery out to see what would happen, and sure enough, the battery listed itself as “turned off.” I wasn’t familiar with the other button on the app’s main home screen, “Snooze,” but it’s pretty useful as well: It pauses the alarm for a few minutes if you’re setting your dinner ablaze in the kitchen. You can also set up your family members, friends, or neighbors as monitors, which is helpful if you’re not around much. And through the Roost app, you can set up every alarm in your house with a location and keep them in a dashboard for monitoring. The price is the most crucial feature here. You won’t get the bells-and-whistles of some smart alarms, like air quality reports or a nightlight, but arguably the important stuff–the connected alarm system–is there. It’s hard to imagine a reason to spend $15 to $85 more for the extras. I haven’t been testing Roost for very long, but it was enough time to get a sense for the level of control it gives you over your alarms (god willing, I won’t ever need to find out whether it works during a real fire). Compared to competitors who offer full-fledged smart alarms, there’s not much missing from Roost’s core functionality. It alerts you of alarms, tells you when you’re battery is running low, and lets you pause the alarm when you need to. It’s also is designed to last for 5 years–or 10 if you don’t mind buying a $15 replacement battery. For people who are actually really into the idea of a fully connected home, Roost may seem bare-bones. It can’t offer things like detailed readings about your home’s air quality, or monitor things like temperature or activity. It is its own app, silo’d off from whatever other smart devices you might use. Take Nest, for example: The company is building a whole ecology of devices that knit a very cohesive web when they’re used together, from Protect, NestCam, and the Thermostat, to its dozens of partner devices that range from car companies to washing machines. For example, if your Protect goes off and you’re not home, you can look around your apartment using the NestCam and see what’s happening. What you can do with Nest as a network of devices is powerful–and it’s only going to get richer as the company further develops its platform. There’s a trade-off here. Do you want buy new alarms and get a richer, more versatile platform? Or do you want to spend a lot less and make your cobweb-coated alarms smart enough to ping you during an emergency or when they need new batteries? If it’s the latter, go for it. Roost is a genuinely useful thing that will set your worrying mind at ease without forcing you to upgrade your entire set of smoke alarms. Just don’t expect it to have the same extras as its more pricey peers.